Joshua Mark and Lauren Benderman* serve Syrian refugees seeking refuge in neighboring Middle Eastern countries. Local evangelists had been visiting the Muslim refugees, and more than 100 of those refugees have become Christians. Joshua Mark presented the workers a vision right out of the Bible — profess a commitment to Christ, grow in discipleship, and then train on how to share your faith. The local leaders joined with Joshua Mark in the vision of discipleship and evangelism. Now, more than 300 Syrian refugees and local Christians have been trained in how to share their faith with other refugees. It could be that, in later years, this movement might reach to Syria — and even throughout the Middle East — helping to overcome the violence and oppression faced by so many. 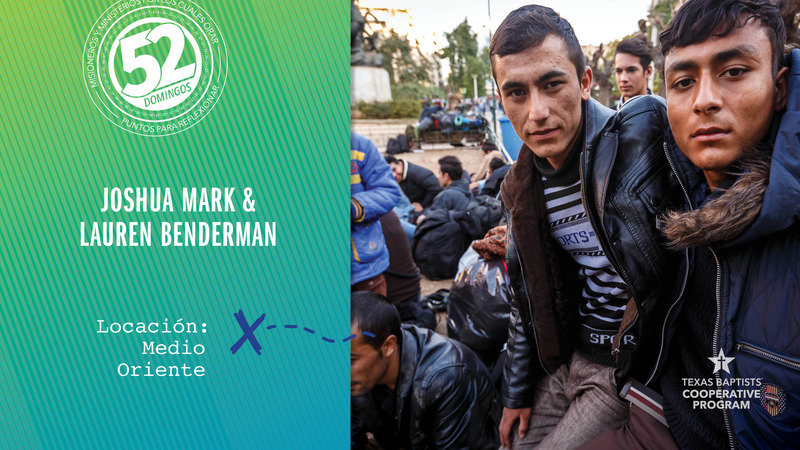 Through our church’s Cooperative Program giving, we are supporting the work of the Bendermans and other missionaries who are sharing the hope of Christ in the midst of great darkness and persecution. Let’s join in prayer today for God’s safety, provision and empowerment of the Bendermans and the local believers being raised up in the Middle East.